On 16th May 1922, the Reichswehr adopted the so-called Buntfarbenanstrich - a multicoloured camouflage finish consisting of three camouflage coours - which was already used in WW I. The first restrictions were formulated in June of the same year. The Buntfarbenanstrich should be used for vehicles and articles of equipment of the frontline units, exclusively. All other vehicles should receive a one-colour coat in Feldgrau - field-grey. Commercial grey, green, brown or blue colours could be used, too. This regulation was specified in HDV 488/1 of 20th April 1933. The three-colour coating should be applied on the combat vehicles, cannons, pontoons, rubber dinghies, tractors, tank dummies, ammunition boxes and accessory boxes for machine-guns, motor vehicles and horse-drawn vehicles. For motorcycles with sidecar, signals and engineering equipment as well as vehicles of the rearward offices, a one-colour painting in Feldgrau was dictated. Passenger cars of the higher staffs and agencies should be painted in Feldgrau or commercial grey with black chassis and fenders. The used colours were chosen out of the Farbkarte - colour chart - 840 B2 of June 1932. The colours Erdgelb - earth-yellow - Nr. 17 (later RAL 8002, today RAL 0704030! ), Grün - green - Nr. 28 (today RAL 6007) and Braun - brown - Nr. 18 (RAL 8010, today no more used) were used for the three-colour camouflage coat. Schwarz - black - Nr. 5 (today RAL 9005) could be used as boundary around the camouflage colour patches. The colour Feldgrau - field-grey - Nr. 3 corresponds to today's Grauoliv - grey-olive - RAL 6006. Beginning in 1937, the colour Feldgrau Nr. 3 was no more used on vehicles. This colour should be used for articles of equipment, only. The three-colour camouflage coat was in use for a long time, nearly 20 years. The applied camouflage patterns differed depending on when the equipment was manufactured. At first, the colour was applied with brushes, later with spray guns. It can’t be excluded that different green, brown and earth-yellow colours out of Farbkarte 840 B2 were used. Among others, the colours No. 22 (RAL 1005), No. 27 (RAL 6002) and No. 18g (RAL 8014) could be proven on historical exhibits. 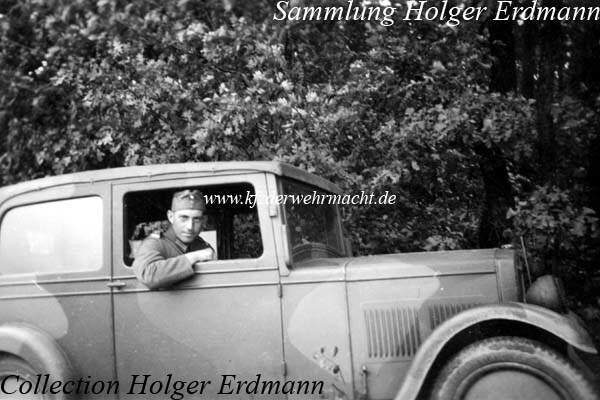 This Hanomag 4/20 PS had the three-colour camouflage finish of the Reichswehr. The darkest tone is the green, the middle tone is the brown and the lightest tone is the earth-yellow. 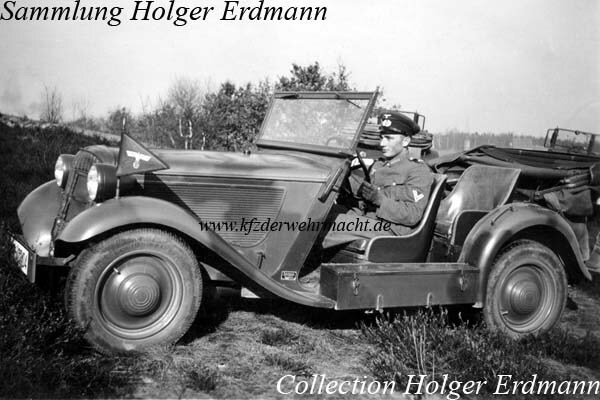 This BMW 315 Kübelwagen was painted in the three colour camouflage finish of the Reichswehr, too. Most probably it was applied with sharp edges by a spray gun.